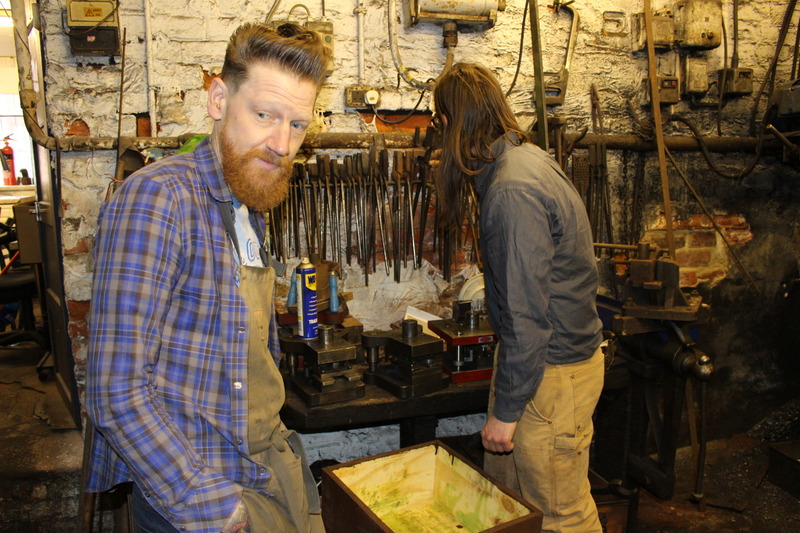 HebTroCo makes their Barlow pocket knife in the workshop of Michael May in Sheffield, and I found myself there by their invitation on a windy Tuesday in March. This is the second in a series of articles about the background and makers of the HebTroCo products. Whenever I arrive in a new place, I like to go walkabout. Get a sense of the place, discover what lies behind it. Walking around today’s Sheffield it’s easy to not realise the massive contribution it made to the evolution of society. I’m not talking about the Human Leagues “Dare” album, though any city would be proud to be associated with such a fine piece of 80’s electronic pop music. No, the achievements of old Sheffield are very much more significant than contributions to music, be it electronic of the more metallic kind. Sheffield is steel city, home of the greatest advances in the blending of iron and carbon to create steel that was stronger, more flexible or even stainless. The spine of the Industrial Revolution and arguably one of the most important advances in human science. How many places can claim such incredible heritage? And “Dare”? The entrance to Portland Works in Sheffield. So, having established that Sheffield provided vital input to the Industrial Revolution, why do I find myself at the historic site of Portland Works on a windy Tuesday in March? Well, Portland Works is where the first stainless steel cutlery saw the light of day and the buildings here have been in place since the 1870’s. That’s 150 years worth of time, notwithstanding that Sheffield saw some serious damage done during WW2, it’s remarkable for the original buildings to still be in good shape. The original staircases are in place, twisty and narrow, worn by all those footsteps over the years. Looking around you can see signs of activity both new and old, writing on the walls, modifications and changes, but underlying it all the old stone buildings. The main reason I’m here today is Michael May, one of a dying breed of pocketknife makers in the area. That’s not strictly accurate though, Michael is really one of the new generations of pocket knife makers. The old guys, what’s left of the original “Little Mesters” as they were called, are now fast approaching triple-digit birthdays, and Michael is a mere youngster at 38. Michael is an old-school craftsman though. He’s worked his years and paid his dues, he’s got the hipster haircut to go with the artisan description. Only, according to Michael, an artisan is “a middle-class person doing a working-class job”. You can’t say it fairer than that. Michael May in conversation with Ed from HebTroCO. Michael had 11 years industry experience before the opportunity arose that allowed him to purchase the tools from a craftsman calling it a day. He decided to go it alone and found a workshop at Portland Works. Now home to a variety of small workshops, it would seem a perfect place to do some proper crafting. For Michael though, there is an added bonus: The Forge. Yes, you read right, the mighty forge is part of the reason we’re here today. 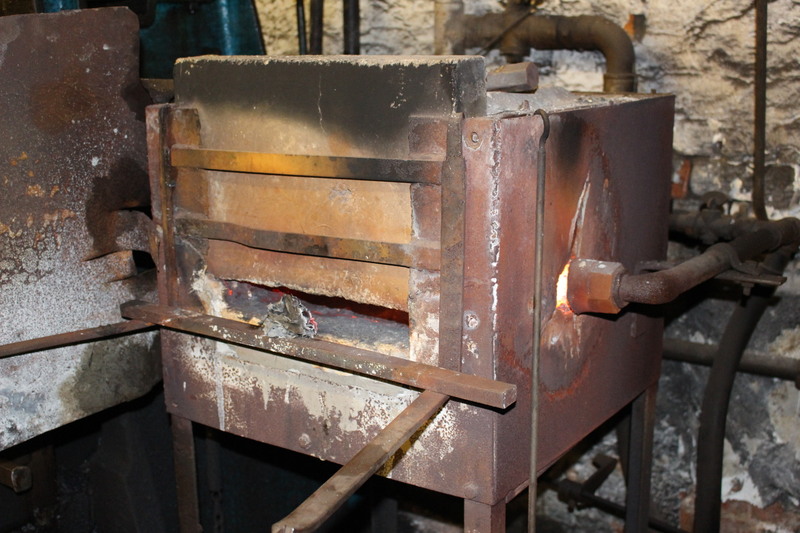 If you work in steel, a forge is kind of a handy thing to have around, you need it to heat the steel so it can be beaten into shape. 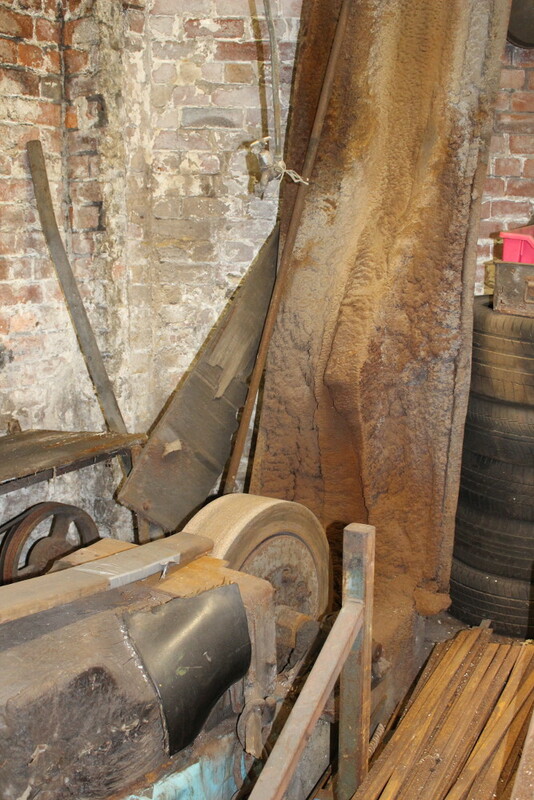 And this forge has been blasting heat for the past 150 years, so it’s no novice to the job. Heat is only part of the story though, there’s also all the machines. The ones that look at the steel, glowing red, and think “We’ll soon hammer some shape into that!”. It’s incredible to see these old machines, made of cast iron, totally over-dimensioned, maintainable with oil and grease, and they just keep on going. Today they’d be half the size, twice as efficient and last half as long. 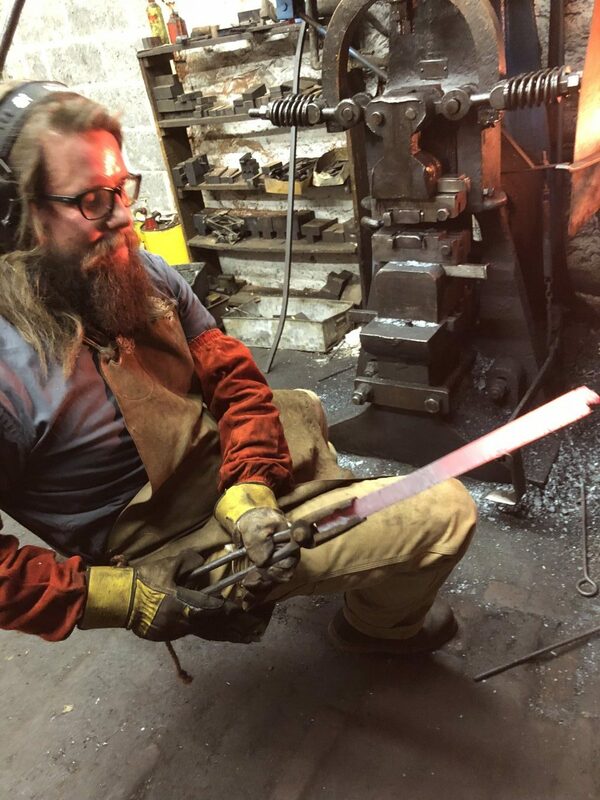 The forge is operated by Joe Moore, and where Michael looks like the hipster rocker (in the best possible way! ), Joe is the metal guy (in every possible way). Long of hair and extremely keen and charismatic when explaining the art of forging and metalwork. There is something that shines through when someone is talking about something they are incredibly dedicated to and interested in, and anyone observing could tell that bashing pieces of steel together was very much Joe’s thing. It’s not really about the bashing though, it’s about what the bashing does. If you’re going to make a blade for a knife, you may start out with a piece of steel, you’ll shape it, grind it into shape and then finally sharpen it. That’s like the training wheels of knife blades. Then you could go further by welding several grades of steel together, take three as a nice number. 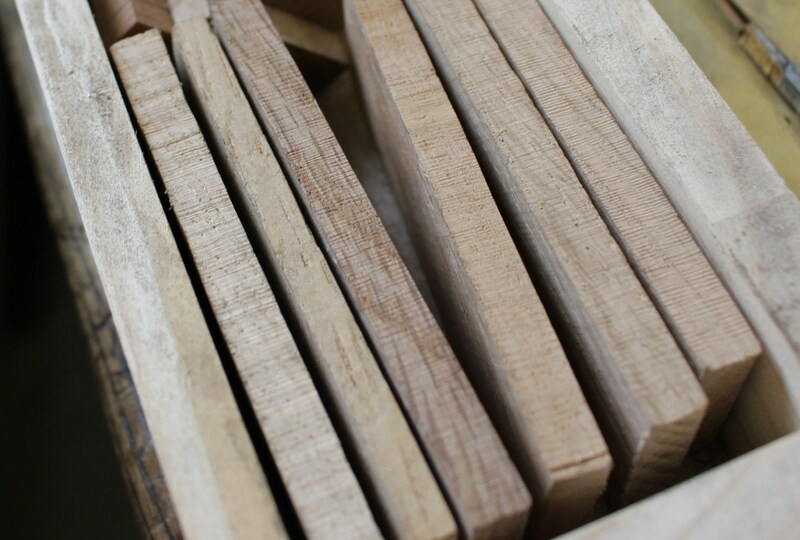 The various grades have various properties, which ensure the blade can be made sharp and hold it’s sharpness. Welding the layers together gives the end result a combination of the properties and increases the grade of the end result. 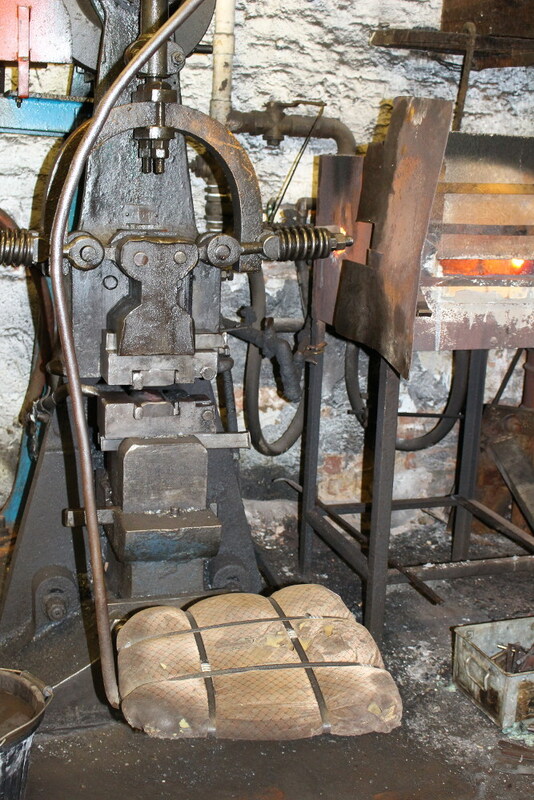 The forge itself. It takes hours to reach operating temperature and heats the workshop nicely. 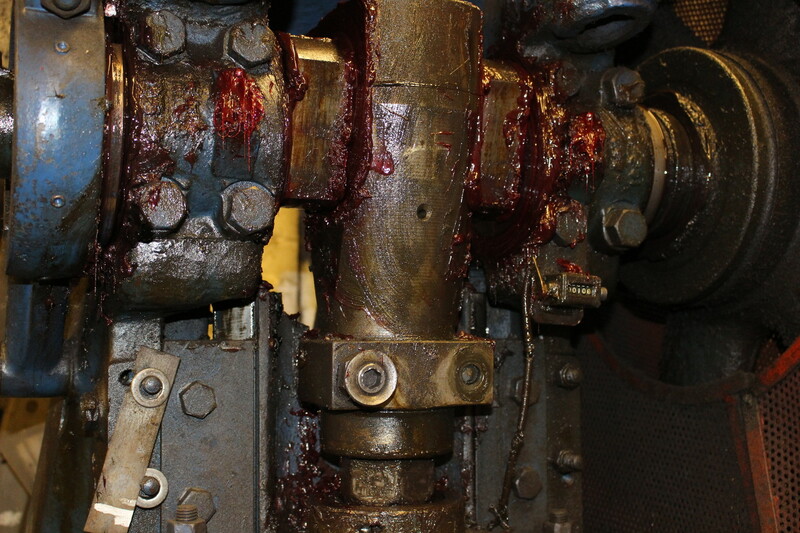 The hydraulic hammer than beats the red-glowing steel into shape. Notice the clever swinging seat that allows the operator to move between forge and hammer with little effort. Make it solid, maintain with grease and oil and it will last almost forever. Or you make a leap into the impossible. If the single grade steel is the Morris Minor and the three-grade steel the modern Ford, the Damascus steel variant is like the MacLaren P1. 153 layers of steel, recognisable by the wavy pattern on the blade. It’s the Samurai sword of pocket knives, 153 layers of steel hammered flat, folded and added to and hammered flat. Repeat a few times more, exponentially increasing the number of layers, wham wham wham, all using a hydraulic hammer from 1870. I don’t know about you, but things like this speak to me on a fundamental level and what they say is “You must have me.”. It’s really quite scary, as I very rarely in my daily business require the service of a pocket knife, but through seeing the actual process I am utterly convinced I desperately require one. Damascus steel underway. The layers of steel are hammered into a long shape, folded over and welded together and hammered out again. The knifemaker and the blacksmith. Things are happening for May and Moore at Portland Works. At some point a long time ago someone noticed the spatte rfrom the whetstone was hitting the wall, so they put a metal sheet there. A hundred years later, the makeshift solution is still there. It doesn’t have to be complicated to work. The Damascus steel is naturally the starting point of the Barlow pocket knife though. The blade is the functional centre point of a knife, after all. Yet, we’re in Yorkshire, so there must be ways of making it even more local? Indeed there are. The handle is made up of Yorkshire oak for the wood part, and Whitby Jet for the fancy part. Oak is easy enough to fathom, and anyone that followed “Heartbeat” has some idea of Whitby being a place within a reasonable distance of Aidensfield, but what is this “jet” they speaketh of? It’s actually fossilised wood, a precursor to coal, and something of a fashionable gemstone of sorts among royalty around 1850. 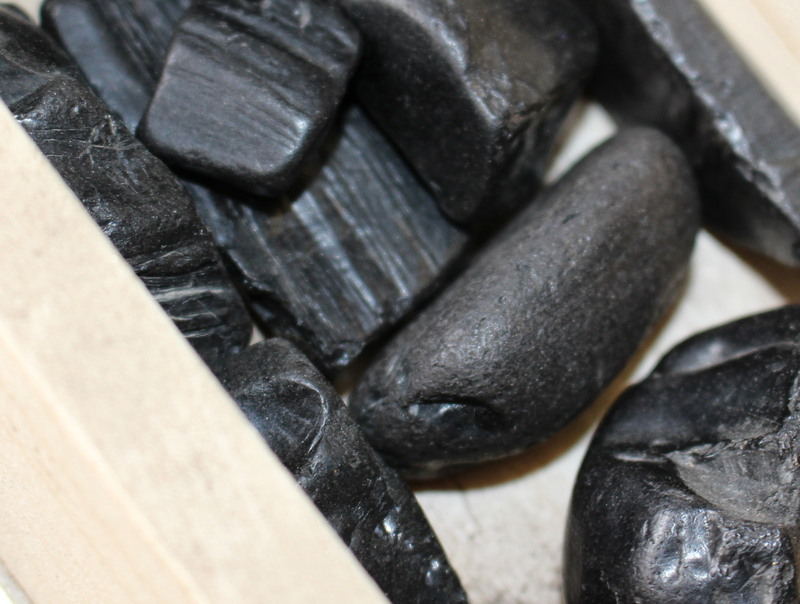 It takes nature some 180 million years to convert wood to Whitby Jet, so it’s a fairly slow process. The main part of the handle is made from the local Yorkshire oak. The locally sourced gemstone “Whitby Jet” is used to add a Yorkshire flavour. Add in the brass bits and the forged Damascus steel blade and the basic components are ready. It comes nicely together though, in Michaels workshop. There’s not computer controlled laser cutters here, nor 3D-printers, or even much in the way of very modern machinery. For the most part, it’s hand tools, a grand selection of files. The tools that are electrified could just as easily have been driven by belts off a steam engine as the modern 220 Volt electric motors. It’s a case of the skill being in the hands of the craftsman, not in the machinery. 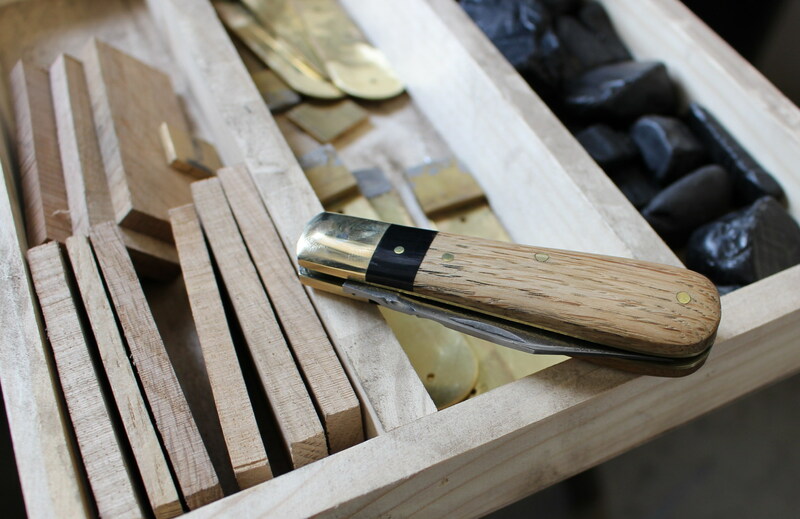 The job takes as many strokes of the file as it takes, the whirly curly bits require their attention, and after a certain number of hours of cutting, grinding, sanding and polishing, a beautiful pocket knife is ready to be appreciated by its new owner. And to new owners, they go, not just to locals proud of Sheffield craftsmanship, but to collectors and connoisseurs worldwide. So many so that there is little need to advertise, as there is always a waiting list. And after much crafting and effort, the result is the Barlow Knife for HebTroCo. In an age where everything of value appears to be digital, it gives me immense joy to see items of beauty crafted by humans. Be it the bodywork of a classic sports car, a wondrously crafted leather boot, or the meticulous and precise crafting of a beautiful pocket knife. I’m quite sure the purpose of it will become clear to me. The Barlow Knife is available from HebTroCo. You can read more about Michael May and his craft on his website here. Bonus 2: This is what really happens “on set”. As I understood it, the hair and beard were seen as safety measures. If you smell burning hair, you know you are on fire and should back off. Something like that… And no, I’m not kidding! Burning hair does have a very distinctive smell! Nice to see your use of Whitby Jet, fossilised monkey puzzle tree.l am now a proud owner of one of these knives and will treasure it.